Oman has deep roots tracing back to an ancient civilization which was known as Magan to ancient Persians and Mesopotamians. The Arab tribes in Oman adopted Islam during the lifetime of the prophet and since then, Oman has generally remained an independent Arab and Muslim entity. Though existing as a distinct nation for several thousand years, the modern state—the Sultanate of Oman—was created of the last two centuries. In this time the territorial concept of nation of Oman was altered by the independence of the northwestern part of Oman as the United Arab Emirates(UAE) and the absorption of the southern region of Dhofar into the Sultanate. Oman is located on the southeastern Arabian Peninsula just east of the Rub al Khali desert, and is the peninsula’s second largest country by area with a land mass with 309,500 square kilometers. The Sultanate is bordered by the nations of the UAE to the north-west, Saudi Arabia to the west, and Yemen to the south-west on one side and the Arabian Sea, Gulf of Oman, and Persian Gulf on the other with a coastline of 2,092 km. The country has remained isolated and devoid of external interference due to the seas in the north and east and deserts to west and south. The culture of the country is deeply influenced by its geography with the al Batinah coastal plain that lies along the Gulf of Oman containing most of Oman’s population in the north and the mountainous backbone which parallels the it along with interior plains has giving rise to numerous valley where many villages are settled. The Interior including the al Hajar Mountains which provides water to agriculture in the area as well as to the al Batinah coast and the sparsely populated hilly coastal area stretching from Ras al Hadd down to the Dhofar Governate, feature rich fishing grounds. The mountainous Dhofar Governate in the south is home to fertile agricultural and livestock lands, and the annual monsoonal fog while the central flat lands contains salt basins where most of Oman’s hydrocarbon reservoirs are found. Furthermore, Northern Oman is separated from southern Dhofar by several hundred miles of desert, which results in the cultural distinctiveness of the different areas. Traditionally, Oman's capital was located in the interior but Muscat, the principal seaport, has served as the capital since the beginning of the nineteenth century. The capital area is home to more than 1 million inhabitants and is the political, economic and cultural centre of the country. It is from here that Sultan Qaboos bin Said has ruled over the country since July 23rd 1970. Over the last forty years the Sultanate has seen extremely fast paced development of infrastructure and amenities while ensuring that the culture of the region is not lost amidst modernity. Visitors to the country therefore have the rare opportunity to discover the traditional way of life in the Arabic peninsular with all the modern trapping and comforts offered by a safe and fast developing state. The local people are extremely open and tolerant towards foreigners and one can move around freely without restrictions. Visitors can experience the Omani hospitality accepting one of the many invitations to tea, Arabic coffee and dates which are offered. Although the dominant cultural group in Oman is Arab and Ibadi/Sunni Muslim, the culture in the country has been very tolerant of other groups. Ethnic, sectarian, or linguistic conflict rarely occurs in Oman. 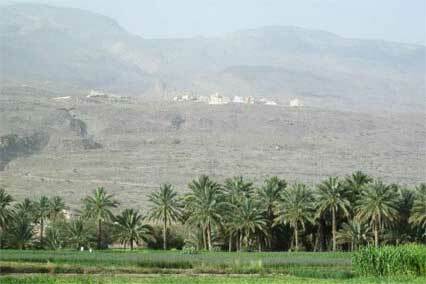 Al Hamra is a scenic provincial town situated at the foothills of the western Al Hajar mountains of Oman. It dates back to more than four hundred years and was situated by an oasis 670 m above sea level. However, its real charm lies in walking through the upper parts of Al Hamra which is populated by ancient multi-storey mudbrick houses that were abandoned many years ago. The Yemani influence is clearly visible in these buildings and the walk through the abandoned streets is a fantastic experience. Many people in Al Hamra use bicycles to cover the long distances within the town making it one of the most cycling friendly places in Oman. There are local bikes shops inn town from where one can hire cycles. Beware though, that the cycles available at most places are not of very great quality and build and ask your tour planner to suggest some good places from where you can get a bike in Al Hamra. Visitors have the opportunity to interact with the townsfolks here; not just Omani, but also the large working population that has settled here from different parts of the world, with the vast majority is from the Indian subcontinent.However of the people of Al Hamra are absent from here during the week as they work in Muscat and are weekend commuters, making for a quiet town during the week. With the presence of the shopping street in Al Hamra and several small supermarkets, simple restaurants, pharmacies and banks with ATM’s, the town is the perfect base of operations for tours in the area. The main town lies just 20km north of Bahla and sits at a distance of 40km from Nizwa, offering easy access to the sights of these towns and other in the area. Al Hamra is centrally situated, and has many interesting things to see in town, like the Bait Al Safa Museum, which explores the history of the area making it a great starting or ending point for tours. Al Hamra offers a range of both easy and difficult cycling and hikings routes leading to a variety of different places such as the beautiful mountain villages, oasis, Wadis’s and much more. A network of small paved and unpaved roads links Al Hamra to the surrounding villages and to places reaching up to 2300 m in elevation. Most of these villages with their palm plantations and green fields are a sight for sore eyes and a complete contrast to the barren mountains that are so typical of Oman. Additionally there are unpaved roads reaching from the valley up to 2300 m elevation and being partly adventurous and partly steep. From nature lovers to adventure seekers and heritage entusiasts, there is something for everyone. You can choose for easy to challenging trails with a variety of different lengths and difficulties. You can also club your cycling or hiking tour in Al Hamra with a visit to the nearby towns and explore the other places to visit in Oman like the Al Hoota Caves, Misfat Al Abriyeen, Jabal Shams, the tallest mountain in the country standing at a height of 3009 m above sea level. Most of Oman is dry desert, with the climate being hot all year around with heavy humid atmosphere along the coast and hot and dry in the interiors. This is why the region of Al Hamra is a must visit offering a refreshing break from the rests. Situated by an oasis and surrounded by valleys, the area is a cool haven compared to the deserts that cover most of the country. While exploring the mountain trails you will find dense greenery, cool springs and lush oasis’ that are sure to delight. The best time to outdoor tours in Oman is from October to April, when the climate matches pretty much the summer in Central Europe just a lot more stable and sunny. With day time temperatures around 25 degrees Celcius in the valley it is the ideal weather to set out for some nice hiking or cycling tour in Al Hamra. The occasional afternoon thunderstorm may crop up as a pleasant relief with rainy days making for absolutely amazing weather after with nature blossoming to a lush greenery all along the valley. At higher altitudes on the mountainside one will even encounter frost at night-time with the strong sunlight during the day melting it and to lets the temperatures rise to well above 20 degrees. Thus during winter it is recommended that you bring a light jacket to weather downhills, potential wind and cooler nights.